Such lovely flowers. Aren't yellow flowers just some of the prettiest found in nature? I always look forward to Black Eyed Susans this time of year! I love your shot. I actually think this flower has a personality. The name even sounds human like. Very beautiful flowers! Thanks for hosting and Happy WW! A very nice photo. They are such beautiful flowers. Oh, those were one of my mom's favorite flowers. Nice to see some on a summer day. I really like the depth in this photo! Those are so lovely. Just love coming here and seeing the flowers. love my black eyed Susans! I've always loved the name of these beauties! These are wonderful flowers! I have a plethora of them in my yard! I love the imagery of of your quote. ready to dance! 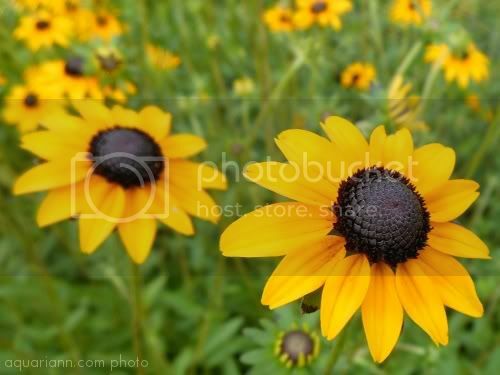 I really like Black Eyed Susans. I know they grow like weeds overpower flower beds, but I still like them. Great capture of the flowers! I love the soft blur of the ones behind. Happy WW! Beautiful shot. Love how you captured the glossy blackness of the flower center. Oh we have these! Aren't they so cheery and bright? Love 'em! Beautiful as always! Great color and detail. Lovely flowers. I would have confused them with sunflowers. Ooh, one of my favorites! Fantastic color! I love these, they seem so friendly and cheerful! So pretty. Black eyed Susans are such a sweet, old-fashioned flower.